A bootleg record consists of unreleased material recorded at concerts, studio outtakes, and radio or TV broadcasts. In the 60s unauthorized rock bootlegs records became available on vinyl and they continued to be issued in this format throughout the 70s and into the early 80s. Bootlegs records were generally sold in underground shops around the world and through mail-order. In the seventies the average pressing in the USA of a bootleg was 1,000 copies; in Europe 500 to 1,000 copies. 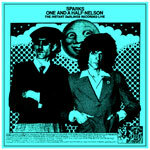 Sparks' "One And A Half-Nelson" bootleg was released on the enigmatic TAKRL operating out of Los Angeles and the catalog number of the record was 1947. TAKRL was a prolific label which also had a slide in quality at the end of the seventies. However, it was responsible for some excellent releases. The two bootleggers behind this label were Dr. Terrence "Telly" Fone and Ken from famous TMOQ label. After some unnerving investigation from the FBI, TAKRL finally shut down in 1976/1977. Here is the track listing of "One And A Half-Nelson"; Side one : Hasta Manana Monsieur, Something For The Girl With Everything, Talent Is An Asset, Thank God It's Not Christmas, Lost And Found (studio version). Side two : B.C, Here In Heaven, This Town Ain't Big Enough For The Both Of Us, Barbecutie (studio version), and Alabamy Right (studio version). 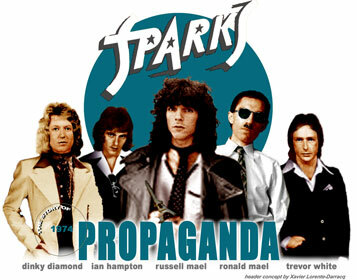 Sparks lineup was as followed : Russell Mael on vocals, Ron Mael on keyboards, Norman "Dinky" Diamond on drums, bassist Ian Hampton (replacing Martin Gordon from the "Kimono My House" sessions) and guitarist Trevor White. The sound quality was fine - just a little bit of phasing in the beginning - but the record was really cheaply packaged (in the 70s' most bootlegs were poorly annotated with photocopied covers). The album sleeve was a two colour paper insert slipped under the shrink wrap that enclosed the plain white cardboard album cover. The sheet featured a crude greeny xerox art with a photo of the Maels from the "Kimono My House" Lp inner sleeve with a hand-written track listing at the bottom. The disc got plain white blank labels. 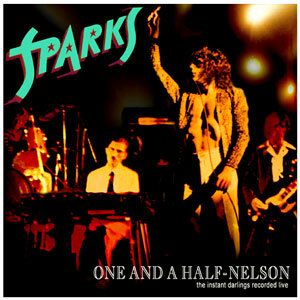 Sparks' "One And A Half-Nelson" record was a really scarce - and rather expensive - item and it obviously became the "Holy Grail" for Sparks die-hard fans. It was extremely hard to find but was the perfect way for fans to listen to versions of songs for which live recordings were never officially released. The late 80s' brought the introduction of the bootleg Cd and the demise of vinyl, so "One And A Half-Nelson" was reissued in Cd with an artwork featuring the pic from the back cover of "Propaganda" (All Of The World label, 95016, USA). Many bonus tracks were added on the Cd release : Russell Mael announcing the concert and live versions of the songs Get In The Swing, B.C, Something For The Girl With Everything, Talent Is An Asset, Never Turn Your Back On Mother Earth, Hospitality On Parade, This Town Ain't Big Enough For The Both Of Us and Amateur Hour. Most of these songs were recorded live during the second major British tour when Sparks' third British album "Indiscreet" had just been released on Island Records. This concert was noticebly larger than the one from the original vinyl (with more girls !). Nowadays this Cd bootleg has been reduced to the under-the-counter status of its vinyl ancestor, no longer easy to find, many are now cut in small numbers on CDrs. "One And A Half-Nelson" seems to be easier to duplicate now and it can be easily found via internet. 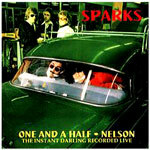 In 1993 a recording master tape of the Fairfields Hall concert (Croydon U.K, 9th of November 1975) was cleaned up to digital by the Sparks Organization and two songs from the gig, "Achoo" & This Town Aint Big Enough For Both of Us", became available on an official Sparks' Cd, "Sparks, The Hell Collection", released for the french market only. Russell Mael : "We sprayed down the live tape with a little "Lysol" disinfectant and today it doesn't sound half bad. (...) The version of This Town Aint Big Enough For Both of Us" was true to the original recorded version of the song which had one extra verse that was edited out before its release. Also, it took a lot longer to get to the scream as it does in this version."